Headline gross revenue includes S$3.1 mn pre-termination compensation from J&J. Underlying recurring gross revenue was in with expectation. Organic growth driven by Hewlett-Packard (HP) build-to-suit (BTS) at Depot Close: Both Phase One and Phase Two are now income producing. The QoQ lower occupancy for Hi-Tech Buildings is a mathematical effect of the lag between obtaining TOP and occupation. 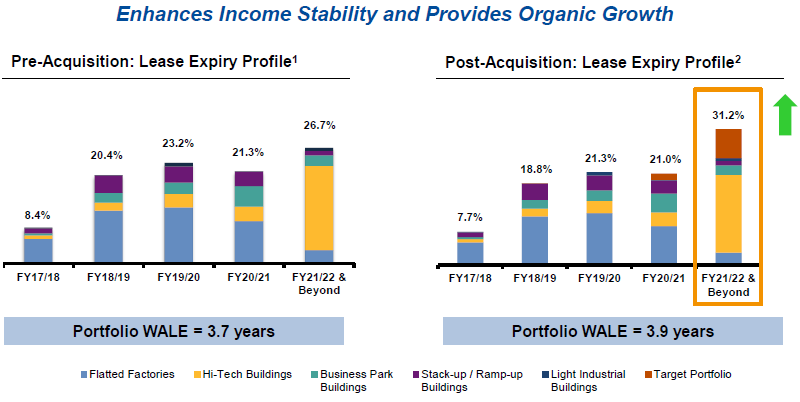 Portfolio weighted average rental reversion of +2.8%: Driven by renewal of a data centre tenant in the Hi-Tech Buildings segment and the Flatted Factories segment. However, negative reversions of up to -1.8% was seen in the rest of the portfolio. Drag from Johnson & Johnson (J&J) pre-termination: While the S$3.1 mn pre-termination compensation will be paid out in full and provide a boost to 2Q FY18 DPU, the vacated space (28% of NLA at The Strategy) has only been 15% back-filled. Marginally lower QoQ occupancy from 92.6% to 90.4%: Mainly due to lower occupancies in all segments except Light Industrial Buildings segment, which secured some smaller new tenants. The outlook is stable. 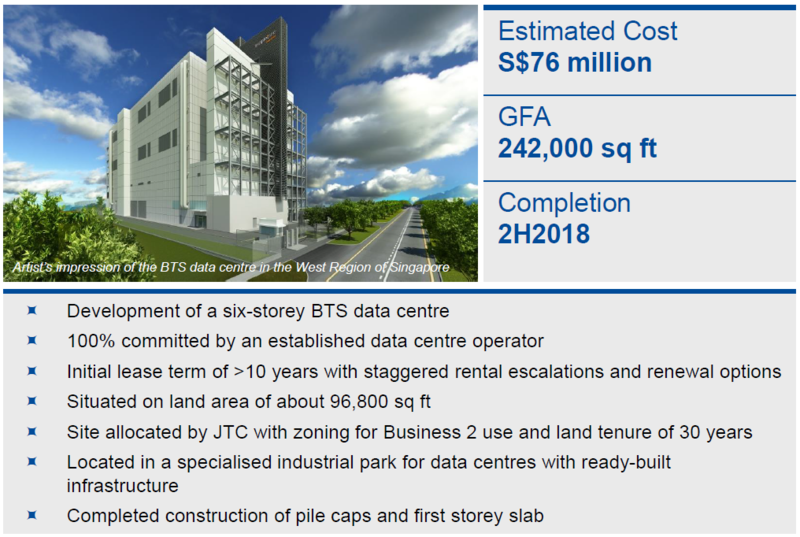 The USA expansion into data centres provides access to a burgeoning asset class that offsets the limited prospects in Singapore industrial space. The trade-offs however are: higher cost of onshore USD debt compared to SGD debt; and US withholding tax that is 10%-15% of NPI. We incorporate the effects of the JV with MIPL into our model. 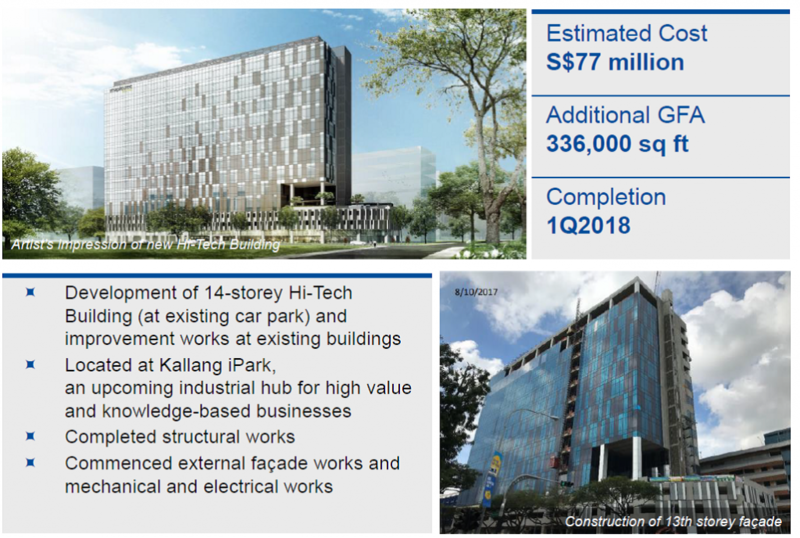 With the acquisition of the target portfolio, our target price moves up only slightly due to the effects of higher interest expense from additional S$30.7 mn debt at the Trust level, and 3.8% larger unit base from the Private Placement. Our target price represents an implied 1.37x FY18e P/NAV multiple. The asset enhancement initiative (AEI) remains on track for completion in 1Q 2018. The structural works have been completed and external façade works and mechanical and electrical works have commenced. Pre-commitment level remains unchanged from the previous quarter – a child care centre taking up about 3% of the space. The build to suit (BTS) project remains on track for completion in 2H 2018. The construction of the pile caps and first storey slab have been completed. Access to a diversified platform: The target portfolio is geographically diversified across the USA, but mostly around the South and East. The properties are mostly (90.6%) shell-and-core and all tenants are on triple net leases; this mitigates operational risks/expenses for MINT. The target portfolio’s occupancy is 97.4%. Increasing exposure to a burgeoning asset class and lengthening overall WALE: Drivers for data centre growth include data creation/storage, and Internet of Things. Demand for data centre is expected to grow at a CAGR of 5.3% between 2015 and 2020. 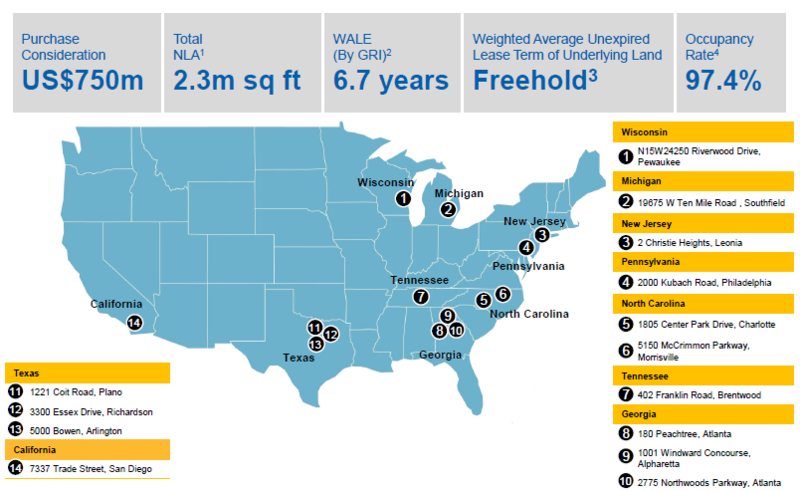 The target portfolio’s WALE (by GRI) stand at 6.7 years and would lengthen MINT’s overall portfolio WALE to 3.9 years on a pro forma basis with annual rental escalations. JV has been structured to give a reasonable level of exposure: The manager explained that the 60:40 proportion was driven by a “measured approach” to give MINT just under 10% of overseas exposure. Recall in the recent announcement to the Expansion of Investment Strategy, MINT will limit its overseas data centre exposure to 20% of portfolio value. MINT will also have the Right of First Refusal (ROFR) over the target properties. Lastly, MINT will launch a Private Placement to raise no less than S$125 mn through 68.307 mn new units to partially fund the acquisition. 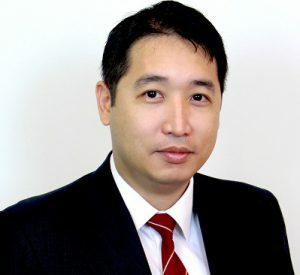 The balance will be funded by debt: MINT will take on additional US$30.7 mn (S$41.8) debt at the Trust level, and US$184 mn (~$250.2) within the JV structure. MINT’s pro forma aggregate leverage is expected to rise to 34.0% from 30% as at 30 September 2017.